Found on an exterior wall of a block home in Eldoret, Kenya. January 2014. Length is about 15 mm. 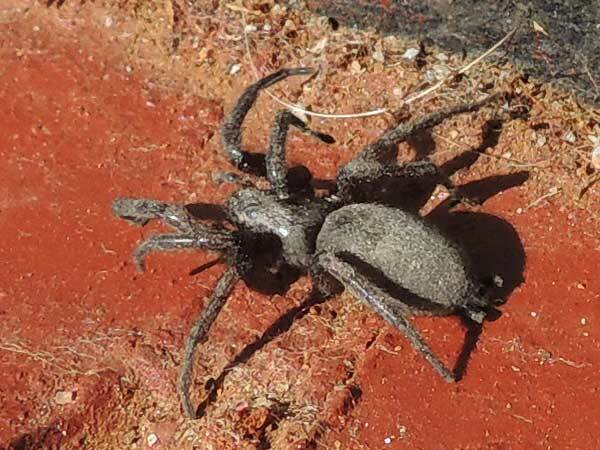 Spaces between morter joints and boards on the exterior of houses through much of the warmer parts of the world are very often inhabited by spiders in the family Filistatidae. There are a number of very similar species that require microscopic examination to be sure of the exact species identification. A few dozen white-looking threads radiate away from an entry point. The silk's appearance is related to the very fine, hackled threads that make up the lines. These fine thread get tangled into minute hairs and imperfections on the insect prey. The smallest fibers are so fine that they scatter light waves. These are not aggressive spiders and probably provide homeowners a great service by intercepting insects that might otherwise have entered the home as pests. Copyright Michael J. Plagens. Page created 7 May 2014.